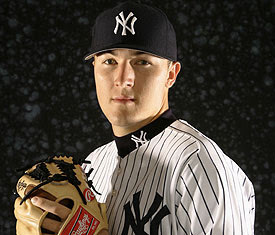 He was supposed to be the new ace of the New York Yankees. A young star for a franchise with a long history of winning and turning good baseball players into media icons. But that did not happen for Phil Hughes as we expected. Instead he struggled, he got hurt, and he was replaced. But the talent that was on display in the minor leagues and in the Arizona prospect showcase was obvious and undeniable. He came into the Yankees camp and had a very solid spring. He was not the worst performer of the starters and by a considerable margin. But because the Yankees often have more faith in the highly salaried than in young phenoms, Hughes was sent to the minors yet again. The Yankees did not start the 2009 season well. Injuries to the lineup's stars and poor performances by the aforementioned highly salaried starters led to unexpected losses and talk of firing the Yankees manager, Joe Girardi, for letting it happen. Chien-Ming Wang, once the Yankees' most reliable starter and winner, was pitching so horribly that he was placed on the disabled list to regain his strength and confidence. Meanwhile, Hughes has gone to Scranton-Wilkes Barre and pitched like the ace he was once destined to become. He was called up to replace Wang in the rotation. Hughes was brilliant in his first start. Then horrible in the next two. He was mediocre in his fourth start, and in his fifth but was starting to flash that incredible ability we all knew was there. his sixth start was awesome. His seventh was not amazing but his skill as a pitcher was becoming obvious to all observers. But by now Wang was healthy again, appearing temporarily in the bullpen. The Yankees needed to make a decision on what to do with each pitcher. They chose to reinstall Wang into the rotation and pushed Hughes into the bullpen. Which brings us to last night. Wang's first start since returning from the disabled list. Overall it would have to be classified as a mediocre start, but Wang looked a lot like the pitcher we had come to know. He had a strikeout-to-walk ratio of 5-1, and induced eight groundballs to just one fly ball in 4 and 2/3 innings. Hughes has yet to appear out of the bullpen. Here is a question that Yankees' fans and fantasy baseball owners are interested in answering. Can Phil Hughes become the missing piece in the Yankees' bullpen? Most observers forget or choose to ignore that Joba Chamberlain was never meant to be a full time relief pitcher. It was never in the Yankees' plans. But he did so well that fans fell in love with the idea, probably because most had never seen him as a starter. No one ever expected Randy Johnson to stay in the bullpen despite his being brilliant in his few appearances there. Mostly because they knew how good he could be as a starter. You don't waste a brilliant starter in the bullpen. Relief pitchers are far easier to find than frontline starters. Admittedly the Yankees have made it look difficult at times. I expect Phil Hughes to do an excellent job out of the Yankees bullpen. I expect him to win and save games when called upon to do so. I expect his strikeout rate to soar and his ERA and WHIP to shrink. This is based on his incredible talent as a pitcher and the boost that usually comes when a starter moves to the bullpen. But next year when Andy Pettitte is gone, Phil Hughes, no matter how good his bullpen resume, must...MUST be returned to the Yankees rotation. Hughes is not, and should not be the future of the Yankees bullpen. Lest I forget that this is not my old Bronx Pride blog, a bit of advice for the owners of Hughes and Wang. Fantasy owners should not be afraid to re-activate Chien-Ming Wang. Wang looks like his old self again and should be the solid (not an ace) starter he was in the past and is expected to be again. Hughes owners should be patient, especially those in keeper leagues. Both pitchers should have positive value in AL-only leagues and in deeper mixed leagues.